Another Central Railway JTBS Recruitment 2018-2019 is added to the Railway Department. So, we are happily intimating the candidates to check the current article very attentively and refer the 500 Jan Sadharan Ticket Booking Sewak Vacancies. The organization of Central Railway Department is stated that many of the candidates are asking to release the Central Railway Recruitment 2018-2019. 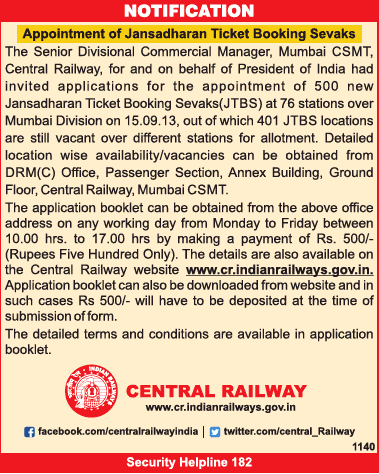 So, finally is the time to apply for Central Railway JTBS Openings 2018-2019. Moreover, we suggest the contenders take a deep look at the current article very attentively and grab the Mandatory information like Education Qualification, Age Details, Application Fee, Starting date to apply, Closing date, Selection Procedure, Salary info etc. Apparently, we have also attached the direct Central Railway JTBS Recruitment 2018-2019 Notification at the end of this post. Slowly verify all the essential details and apply before 2nd April 2018. Right now, many of the candidates in a dilemma about where to check the proper Central Railway JTBS Recruitment 2018-2019 details. For those people, our suggestion is to check the current article completely and utilize the golden opportunity by applying for 500 Jan Sadharan Ticket Booking Sewak Vacancies. We are informing the candidates that a huge number of competitors are in a race to apply for Central Railway JTBS Openings 2018-2019. So, as soon as possible, you have to end up the Application Procedure. Moreover, a vast number of interested competitors are pleasing us to share the entire Eligibility Criteria on a single page. So, for the sake of people, we have collected the info and shared in this post. Without late grab the info which we have given here and proceed to the further steps. So, the Central Railway JTBS Recruitment 2018-2019 is the best job opportunity for the candidates those who are looking for Railway Jobs. Moreover, we are informing the people to check the Education Qualification first. So, coming to the education qualification details, all the contenders must and should complete their 10th/ SSC and 12th from a recognized institute are the qualification to apply for Central Railway JTBS Job Openings 2018-2019. Moreover, a massive number of contenders are tying to know about the detailed info regarding Eligibility Criteria. For those contenders, our main suggestion just follow the present post and use the info we have given. Many of the people are asking that where got all these information. So, we have collected it from the official Notification. The Minimum Age to apply for Central Railway JTBS Recruitment 2018-2019 is 18 Years. We are not sure about the Maximum Age. As soon as possible we will update the current article by providing the latest stuff. Moreover, the Age Relaxation is also applicable for some of the categories. So, to get the age relaxation information, go through the official Advertisement which is available in this article. Also, keep in mind that you have to pay an application fee. So, after filling all the eligibilities you have to pay Rs. 500/- as the Application Fee and submit your forms. To get the Application Fee details go through the official notification. Along with the current page also take a look at the official website of Central Railway Department that is www.cr.indianrailways.gov.in. Many of the candidates are showing their interest in checking the Selection Procedure. So, the selection of the candidates is based on Written Exam and Interview. So, the competition for written test is very high. To help the candidates in their preparation time we have also given the material on our website. So, all the candidates can quickly download it from our site and clear the written test. After completion of the test, the selected people will be called for interview round. So, the final decision is taken by the authority of Central Railway Department. Also, selected contenders can get an attractive pay. Moreover, there is a heavy competition for Central Railway JTBS Openings 2018-2019, so try to apply before the closing date. Meanwhile, we have also attached the direct Advertisement link at the end of this article. Hence, scroll down and check the remaining data. The Central Railway Department mentioned that the Minimum Age to apply for the candidates is 18 Years. So, to check the Maximum age visit the official website or check the official Central Railway JTBS Recruitment 2018-2019 Notification from below. The Age Relaxation is applicable as per the rules and regulations of Government. Those who had done their 10th/ SSC/ 12th can quickly apply for Central Railway JTBS Recruitment 2018-2019. 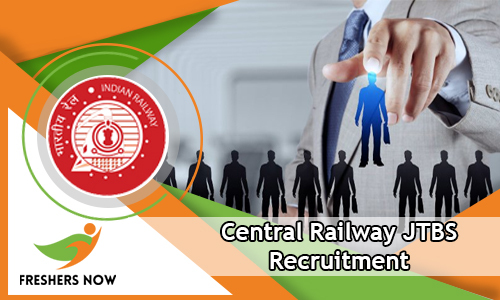 The Central Railway Department want to select the candidates by conducting following rounds. Rs.5,900/- to Rs.7,550/- is the monthly salary for selected candidates. Along with salary, you can also get the Grade Pay. Finally, take a print out for the further usage. So, click on the above link and download the Official Central Railway JTBS Recruitment 2018-2019 Notification. Moreover, keep an eye on our website Freshersnow.